Researchers from the Medical University of Vienna and the Environment Agency Austria presented a pilot study of microplastics found in human stool samples at the United European Gastroenterology conference on October 20-24, 2018. Microplastics are the smallest particles of plastics, their diameter ranging from 10 nanometers (too small for the human eye) to 5 millimeters. They can be found in the air, bottled and tap water, the ocean, the soil, and numerous other common places. 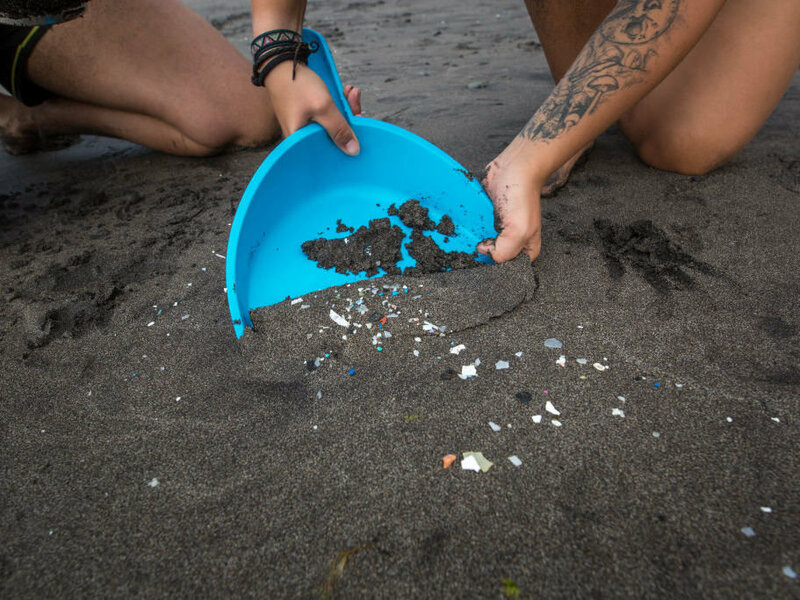 While we do not yet know the effects of microplastics on the human body, there has been research on its effect on marine life and the potential health risks. Microplastics passing through wastewater can pick up harmful bacteria, which can be ingested by humans. They also spread chemicals into water and sources of food, which can affect humans through biomagnification, which occurs when marine animals like zooplankton and fish ingest microplastics which can be transferred to humans when ingested. While the direct effects of microplastics on human health are not yet known, the indirect effects are obvious: as they harm life on lower levels of the food chain, it trickles up to everything above it. The study presented at the conference looked at 8 individuals from 8 different countries (Finland, Italy, Japan, the Netherlands, Poland, Russia, the United Kingdom, and Austria) and found 9 different types of plastic in each stool sample with an average of 20 particles of plastic per 10 grams of excrement. All 8 samples contained plastics that are major components of plastic bottle caps and plastic bottles. This most recent study goes beyond the body digesting microplastics, to asking what happens when these harmful substances are retained in the body rather than excreted. Chelsea Rochman, an ecologist from the University of Toronto, says anything smaller than 150 micrometers, and especially smaller than 50 micrometers, can migrate through the gut wall and into blood cells and organs. Microplastics, which can be as small as 10 nanometers (just 0.01 micrometers) definitely fit the bill. The current concern is whether microplastics are entering the bloodstream, lymphatic system, and possibly the liver. Animal studies have shown microplastics can cause intestinal damage and liver stress. A study published by the Science of the Total Environment journal looked at the effects of microplastics in the guts of mice, and found they could reduce intestinal mucus secretion, which damages the intestinal barrier function. Furthermore, the study found microplastics altered bacteria and metabolic pathways, which caused metabolic disorders. Extensive research has not yet been conducted on higher mammals to see how these effects will extend to human health, but considering the extensive damage, further research is essential in understanding this new effect of climate change. Coming on the heels of the report by the U.N. Intergovernmental Panel on Climate Change, this study provides just another example of the extreme economic transformation necessary to adequately address climate change. The report recounted the fatal effects of the projected 2.7 degrees Fahrenheit increase by 2040, which included submerged coastlines, droughts, poverty, and much more. The world produces 330 million metric tons of plastic per year, 80% of which resides in landfills and other parts of the environment which contribute to microplastics. CNN projects that by 2038, globally we will produce 650 million metric tons of plastic, and by 2050, we will surpass 1300 million metric tons. The U.N. report says avoiding the most serious climate change damage will require $54 trillion in economic transformation. While this is technically possible, it is a political nightmare. One instance of this within the report is heavy taxes on carbon dioxide emissions, possibly reaching $27,000 per ton by the year 2100. Plastics are a major component of greenhouse gas emissions, as seen in a recent study published by the University of Hawaii. They found plastics release methane and ethylene, two major components of greenhouse gases, when exposed to the elements. Though some places like China, the European Union, and California have started to enact carbon pricing programs, with the current political climate within the United States, legislative action to implement these changes is virtually impossible. President Trump has even said he intends to withdraw from the 2015 Paris Agreement, an accord of 195 nations that commits nearly every country to lower global warming and greenhouse gas emissions. Furthermore, the global movement towards right-wing candidates, seen most recently in Brazil with the election of Jair Bolsonaro, will likely lead to more withdrawals from the Paris Agreement. While there are some measures individual states such as California can take to staunch the bleeding caused by climate change in the United States, the movement necessary to adequately respond to the U.N. report demands the support and action of the national government. As one of the top three contributors to greenhouse gases, along with China and the European Union, the U.S. has an obligation to fall into step with the other two countries and face climate change head on. We’re already seeing effects of climate change, ranging from poverty to natural disasters to health effects from microplastics. While the study from the University of Vienna presents only limited findings due to its small size and scope, coming from wealthy and developed countries, it presents the first step to further research on how climate change affects everyday human activity. It’s time for us to put aside partisanship and accept this new reality and the legislative action necessary to confront it.